MUNICH — Beethoven’s Ninth Symphony, complete, is slated for President Trump’s second orchestra concert on the job, to take place, like the first, in Europe, specifically at Hamburg’s new Elbphilharmonie. Details of the July 7 event, part of the 12th G20 Summit, were announced Wednesday by a spokesman for Bundeskanzlerin Angela Merkel. A classical-music fan and the summit’s host, Merkel reportedly chose the program herself. Among summit attendees known to enjoy good music: French president Emmanuel Macron and Russian president Vladimir Putin. Christiane Karg, Okka von der Damerau, Klaus Florian Vogt, Franz-Josef Selig and the Hamburg State Opera Chorus will sing Schiller’s words; the Philharmonic State Orchestra Hamburg will be led by Kent Nagano. Beethoven’s “Ode to Joy” theme, without the words, is the official anthem of the European Union; in the “universal language of music,” the anthem expresses “European ideals of freedom, peace and solidarity.” An on-site dinner is scheduled before the performance. Starting the day before, the Elbphilharmonie will become a Sicherheitszone, or security area — as will the full local width of the Elbe River, three adjacent quays, the airspace, and much of central Hamburg — to prepare for the concert venue’s role as an “official meeting place for the heads of state and government” taking part in the summit. Hamburg police expect “around 8,000 violent demonstrators.” G20 delegations are due to arrive that day; Trump and Putin will be meeting for the first time. 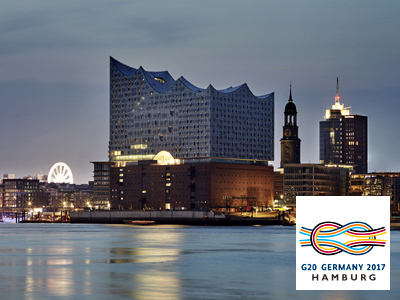 The G20, or Group of Twenty, comprises 19 countries plus the E.U. It accounts for 80% of global economic output in terms of GDP, adjusted for purchasing-power parity. In 2015, China’s GDP was around 19.7 billion “international dollars,” so adjusted, making it the largest economy in the world, followed by the United States, India and Japan. Germany was in fifth place, at 3.9 billion international dollars. This entry was posted on Friday, June 23rd, 2017 at 3:20 pm	and is filed under Munich Times. You can follow any responses to this entry through the RSS 2.0 feed. Both comments and pings are currently closed.